The historic Buddha, the founder of Buddhism, Gautama Siddharta, Siddhattha Gotama, Shakyamuni. Gautama Buddh : FACTS in the WIKIPEDIA ! Bodh Gaya was the place, under the pipal or Bo tree, where the Buddha was enlightened after practising meditation for several years.
. WKD : Ficus religiosa. Pepulbaum . Prince Siddhartha, Buddham Sharanam Gachhami, Gauthama, the Buddha. There are many names for him. 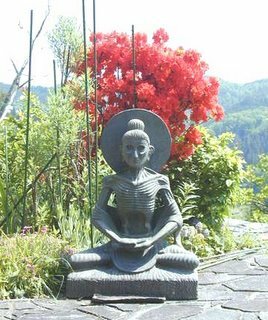 Here is a great article about the development of Buddhist Art. I offer a candle to the dark Buddha. "the complete purification of body, speech and mind, and the blossoming of wholesome deeds in liberation." The allusion adds religious significance and spiritual depth to the poem. The statue of a Laughing Buddha seems to come to life in the lightning flash. "Once a person is caught by belief in a doctrine, one loses all one's freedom. When one becomes dogmatic, that person believes his or her doctrine is the only truth and that all other doctrines are heresy. Disputes and conflicts all arise from narrow views. They can extend endlessly, wasting precious time and sometimes even leading to war. Attachment to views is the greatest impediment to the spiritual path. Bound to narrow views, one becomes so entangled that it is no longer possible to let the door of truth open." Featuring the renowned seventh-century gilt-bronze Śākyamuni (Shaka) triad at the Hōryūji, Constructing the Dharma King reveals how the impression of a Buddhist image evolved in Yamato, Japan, from the indistinct sense of divine otherness at the early stage of the transmission to more concrete ideals and values concerning families, authority, and kingship.